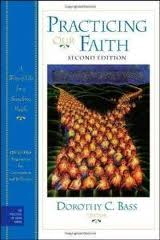 My biased suspicions about a book on faith practices were that it will probably offer some way for the reader to try harder at adding spiritual workouts to one’s life in order to live a more faithful and effective life as a disciple and church member. There is some of that in Practicing Our Faith; but mostly the book is about invigorating small, down-to-earth actions with a greater sense of how they can be practiced for and with a community in response to God’s creative and redemptive work in our lives. Small doesn’t mean easy; but done with others they become much more blessing than burden. The real strength in the book and value for the missional church is found in the ways each chapter urges and gives examples of concrete, shared participation in the practices, even things as personal as “Honoring the Body” and “Dying Well.” It is unlikely that a whole community would embrace all or even most of them in the same way; that could hinder hoped for “human flourishing.” But any community growing in these practices will inevitably serve as a blessing beyond itself.